I am working my way through the house slowly making over each room. I want each room to be fresh, functional, and not show signs of destruction from the kids or dogs. 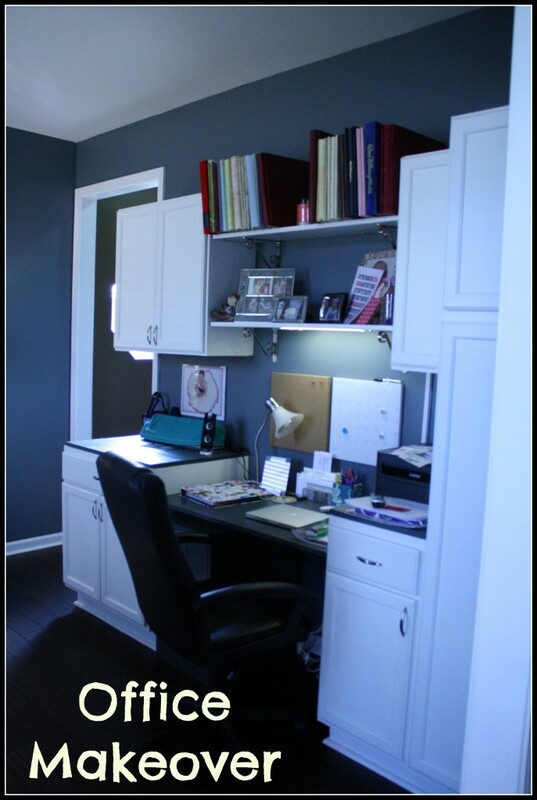 I have completed the bathroom upstairs and now it was time to tackle the office! 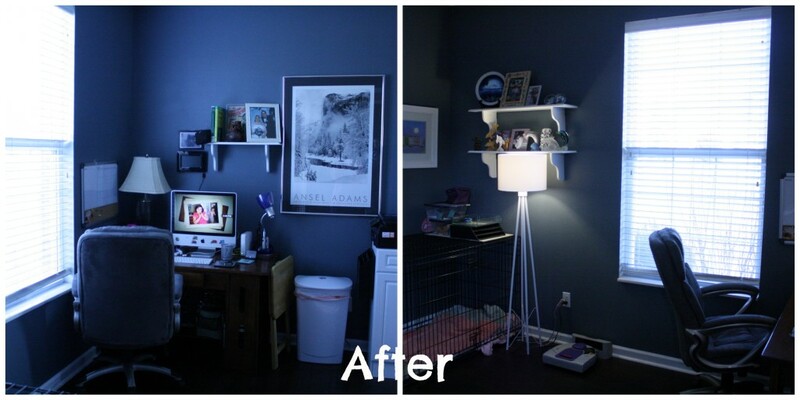 This office makeover took longer than I expected, but it was an involved project. The old office had many issues! First, it had carpet that had been there since the house was built – 13 years. It had seen better days and with dogs and kids and two people sharing an office, it needed to go. The second major problem was no storage! I have to admit, I have A LOT of stuff! I have craft stuff, files, kids artwork, sewing stuff, and of course computer stuff. There was just no where to put all this “stuff”. Finally, due to the clutter and lack of storage, I just had no room to do anything in the office. I often found my desk completely covered in stuff. The first step was to paint over the purple walls. When we moved in to the house, I wanted a purple office and that was great for a few years but I was tired of it. I picked a nice shade of gray that has blue tones to it. It is part of the same shade that will eventually be in the dining room across the hall. Second came the flooring. I did my research on flooring and ordered a sample from a company I found online, Builders Direct. The sample was free and it looked great when I received it. This was the cheapest way to get the flooring that I needed as I am going to put the same in the entry way, dining room, and living room as I work my way through the first floor. I went ahead and decided to put a laminate floor product in the office that is wide plank, darker, and has a hand hewn feel to it. It was a bit hard to get the carpet up and we discovered there were some cracks in the concrete sub-floor that needed to be sealed. That was easy enough to do with a silicone product, but had to wait for it to cure/dry. The flooring took two days to install and included laying down a water barrier and padding product in one. It rolled out and I used some tape to secure it as necessary. The flooring went down easily once we got it started! Getting it started is the hardest part as the floor tends to move each row until it gets heavy enough to stay put. That was the most frustrating part of laying laminate floor. Finally, there was storage and a desk space. Originally, I had drawn out a sketch to have a custom wall unit made but that was going to take too much time and cost more than I had hoped. I decided then to go with pre-made cabinets, the cheapest I could find at Home Depot, and finish them myself by painting them the same white as the trim color in the room. I went with primer included in the paint color to save some time, yet it still took 4 good coats on the cabinets to get them looking the way I wanted. I was able to get all the hardware that I needed for them in a package of 10 so it really saved a lot of money from having to buy the pieces individually. Finally, I needed a desk surface and something to cover the tops of the base cabinets. I looked at pre-cut laminate countertops, but that didn’t work for me. I needed two different heights. I went with a wood board that I painted a shade darker than the wall color and then finished with two top coats of polyurethane to protect it. I now have a nice, organized space where I can work on craft projects, be on the computer, and sew when I want. Everything is stored away in the cabinets and out of sight! My husband has a nice space where his things are all organized and put away and we no longer have the clutter issue we once had. Once the puppy no longer needs her crate, we plan to put a nice chair in that corner of the room for reading. I am very happy with how it turned out. The total budget for the entire project was under $1500. Much more than I had originally planned, due to having to buy pre-made cabinets. Oh wow this turned out really well. I the use of cabinets, there is so much storage now! It looks pretty too! What a difference! I love the cabinets you chose–that’s a great way to add storage. I’m looking into re-decorating our office and having cabinets like that would be such a great idea! Pinning this now–thanks for the inspiration! I also LOVE the blue color on the walls. It’s so calm and classy. Thank you! It made a HUGE difference to paint, change the floor, and add in the cabinets. The storage space is amazing and it’s a great spot to be in now. It looks amazing! I hope you are continuing to love it as you live in it. You’ve earned a wonderful space to work in. Happy Sharefest. Thanks for sharing your success with us. I do really love it! It’s my “grown up” space with no kid stuff allowed which is so nice since they have taken over the rest of the house! Now just need the puppy to get old enough to get rid of the crate and we can have a comfy chair in there for reading. Thank you for stopping by! Your office looks great! We are slowly going through each room in our house, too…Thanks for linking up to the Bloggers Brags Pinterest Party. I have pinned your post to the Bloggers Brags Pinterest Board. It looks amazing! I love looking at remodel projects. Some day I hope to be able to do some of my own, but right now I just can’t. So I will live through the successes of others. Thanks for sharing a definite success! Thank you for much for stopping by! I love changing things up but sometimes I have to scale back due to my health and things I just can’t do anymore. Luckily I have family members that help sometimes. Wow these are some great ideas! This is an oft-neglected area of my house. I do so need to work on it, but, as you know, with two young children (1 and 3) finding time can be tough! Hope your SITS day is going well! Thank you and yes, finding time with small ones is challenging. I am fortunate that both are in school now so I at least get from 7:45 until 2:45 to work on projects when I have one. It’s just keeping my son away from the tools and things once he gets home. He likes to “help” ha ha. Wow! What an amazing transformation! I can’t wait tip I have a space to call my own…so many ideas! Thanks for sharing and Happy SITSDay! Thank you and thank you for stopping by! I know I kept an idea book before I had a house of things I always wanted to try. I still do keep one, it just keeps evolving and changing as the trends change and my likes change. You’ve inspired me! I don’t have much of an “office”, but I do have a cluttered, messy work area/computer armoire. Happy SITS day, late! I’m so glad Jean and thank you for stopping by to visit!